The objective of this research was to determine the volume expansion coefficient of vegetable oil and water as the effective way to study the fluids’ properties when they are heated. The vegetable oil used in this research is the unused vegetable oil of Filma, while the water used in this study is distilled water. The main instrument in this study is the dilatometer which works based on the principle of fluids expansion. The research methods adopted the methods of the previous researchers, in which the experiment of fluids volume expansion had been conducted in two stages for each fluids (in this case, the fluids were vegetable oil and water). The first stage was heating fluids indirectly through absorbed and distributed heat by an amount of water inside the boiling jug. In the second stage, the heat source was stopped and fluids were allowed to continue expanding in volume due to the rising temperature before the fluids finally experiencing volume contraction due to the decrease in temperature. When the cooling process was carried out, observation and recording of data of fluid column length in glass pipe as a function of temperature were held. Based on those data, the changes in fluids volume due to the cooling process could be estimated. By utilizing the linear relation between volume change and temperature change, the volume expansion coefficient values of vegetable oil and water were (7,2 ± 0,2) x 10-4/0C and (3,2 ± 0,2) x 10-4/0C within the limits of the accuracy of the measuring instrument used in the study. Atmoko, R. D. (2008). Penentuan koefisien ekspansi volume zat cair menggunakan metode pengukuran indeks bias zat cair (Skripsi Tidak Dipublikasikan). 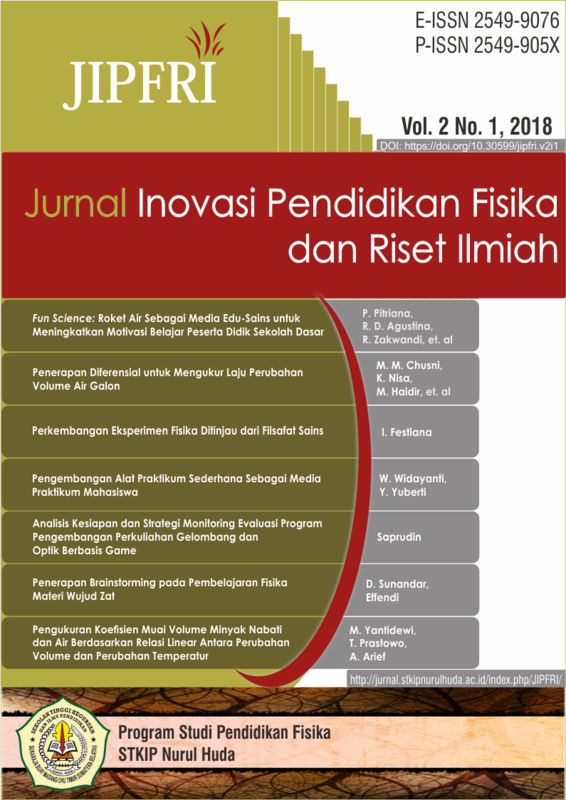 Program Studi Fisika Fakultas Sains dan Teknologi Uiversitas Sanata Dharma, Yogyakarta. Boyd, C. E. (2000). Water quality: An introduction. Norwell, Massachusetts USA: Kluwer Academic Publishings. Leaflets, L. P. (n.d.). Determining the volumetric expansion coefficient. In Heat Thermal expansion Thermal expansion of liquids (pp. 1–4). PHYWE. (n.d.). Thermal expansion in solids and liquids LEP 3.1.01. Germany: PHYWE series of publications. Popiel, C. O., & Wojtkowiak, J. (1998). Simple formulas for thermophysical properties of liquid water for heat transfer calculations (from 0 C to 150 C). Heat transfer engineering, 19(3), 87-101. Rahmawati, E., Sucahyo, I., Prastowo, T., Kusumawati, D. H., & Supardi, Z. A. I. (2014). Meningkatkan kemampuan guru-guru IPA SMP di Sidoarho dalam pengembangan kit termodinamika sederhana untuk pembelajaran dengan pendekatan saintifik. , Prosiding Seminar Nasional Fisika 2014 . Surabaya: Jurusan Fisika FMIPA Universitas Negeri Surabaya. Tippler, P. A. & Mosca, G. (2008). Physics for scientist and engineers with modern physics (6th edition). New York: W. H. Freeman & Company. Yoo, K. H. & Boyd, C. E. (1994). Hydrology and water supply for pond aquaculture (6th edition). Dordrecht: Springer-Science+Bussiness Media, B.V.